One of my greatest joys in life is the love my daughter has for reading. This girl has her nose buried in a book from morning to night. Her first grade teacher last year required 100 minutes of reading per week and she often completed that in a day. She saves her allowance for trips to Barnes & Noble and on the days when her piggy bank has run dry, she uses our heavily worn library card and takes out dozens of chapter books at a time. She is a true book worm and I couldn’t be more proud. Some of her choice picks, however…let’s just say they are not the classics. There are a lot of little ponies, some bossy big sister types, and a puppy or six that line her bookshelves and while it doesn’t bother me — she is reading, after all! – I can’t wait for the day when she can appreciate some of the true great stories of our time. Which is why I am loving the new Puffin in Bloom collection from Penguin Books with beautiful keepsake covers designed by Anna Bond of Rifle Paper Co. Anna’s delightful designs give these beloved books a new dimension that makes you want to dive in now and then promptly put them on display for years to come. No sparkly ponies to be found. She may not appreciate the tales within these pages just yet, but I think that starting her with a collection of these beautiful classics now is a gift – like reading – that will stay with her forever. 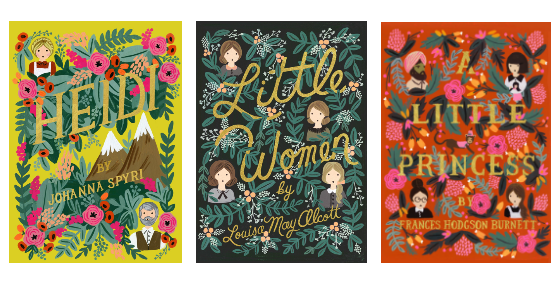 Heidi, Little Women and A Little Princess – are available now.